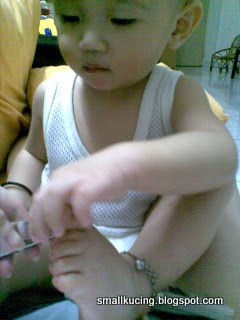 Mamarazzi...cut toes nail please. Toes nail long already. Be careful ya. Don't cut off my toe. Yup..that's the one long. Cut that. 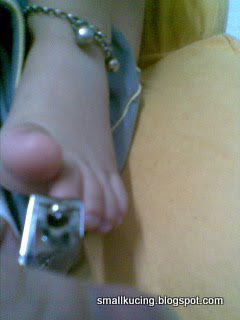 I dont know why,i just love Joshua's anklet,it looks so silvery and cool..
Haha! He wants to cut it himself? LPM,ya loh..he wants to do it himself. 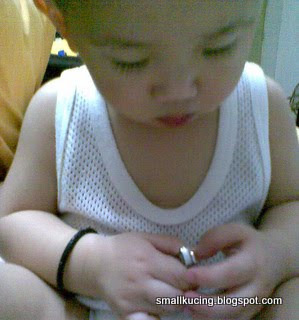 At this age, he likes to imitate what adults do. Hai, thanks for dropping by at my blog. Mind if I add your blog into my blogroll? How should I address you? Your baby boy named Joshua? He is definitely cute. May i know how old is he now? Thanks for visiting, Sarah's Daddy and Mummy. It's kathy here. 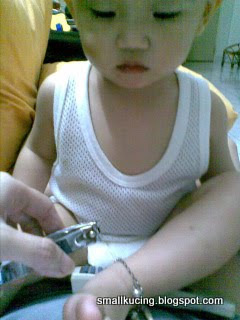 Joshua is 19months old now.Cute but also very naughty.